The Narnia books are mysterious. Millions of people have been captivated by them, but are left with unanswered questions. Why are there seven books? If so, why do four of them seem to have no biblical basis? Why do they lack uniformity? Why does Father Christmas appear in them? - Publisher Many have wondered about the Chronicles of Narnia, unable to answer questions that arise from their reading: Why are there seven books? Why are only three of them obviously biblical allegories? Does the series lack coherence? Many have attempted to find the organising key, but failed. However, in The Narnia Code Michael Ward presents an astonishing literary discovery. Drawing on the whole range of Lewis' writing, Ward reveals the single subject that provides the link between all seven novels in the Chronicles of Narnia. He explains how Lewis structured the series, why he kept the code secret, and what it shows about his understanding of the universe and his Christian faith. About "The Narnia Code: C S Lewis and the Secret of the Seven Heavens"
Many have wondered about the Chronicles of Narnia, unable to answer questions that arise from their reading: Why are there seven books? Why are only three of them obviously biblical allegories? Does the series lack coherence? Many have attempted to find the organising key, but failed. However, in The Narnia Code Michael Ward presents an astonishing literary discovery. 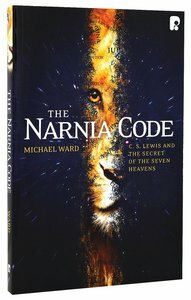 Drawing on the whole range of Lewis' writing, Ward reveals the single subject that provides the link between all seven novels in the Chronicles of Narnia. He explains how Lewis structured the series, why he kept the code secret, and what it shows about his understanding of the universe and his Christian faith. Michael Ward was born in Cuckfield, Sussex, England. He is Senior Research Fellow of Blackfriars Hall, University of Oxford, and Professor of Apologetics at Houston Baptist University, Texas. He has loved the Narnia Chronicles since he was a boy. He first wrote about C.S. Lewis while working for his English degree at the University of Oxford. He lived at Lewis' former home in Oxford, The Kilns, as resident warden for three years (1996-1999), sleeping in the late professor's old bedroom and studying in his study. He appeared in Shadowlands, the film about Lewis' marriage and bereavement. He did his PhD at the University of St. Andrews, and his dissertation was published as Planet Narnia: The Seven Heavens in the Imagination of C.S. Lewis (Oxford University Press, 2008). The British Broadcasting Corporation (BBC) commissioned and broadcast a television documentary about Planet Narnia called The Narnia Code in 2009. Dr. Ward has written numerous scholarly articles on C.S. Lewis and has lectured around the world on his life and work. He is also the coeditor of The Cambridge Companion to C.S. Lewis (2010) and Heresies and How to Avoid Them: Why It Matters What Christians Believe (2007). On the fiftieth anniversary of Lewis' death, Dr Ward unveiled a permanent national memorial to him in Poets' Corner, Westminster Abbey, London. Customer Reviews For "The Narnia Code: C S Lewis and the Secret of the Seven Heavens"
Upon buying this book, I was hoping for some explanation of Narnia and the unexplained subplots within the narrative (such as the Wood Between Worlds, etc.). However, this book seemed to confuse more than explain, through its elaboration of Greek and Roman mythos that seemed out of place in the book. I was hoping for an explanation of the Christian values C.S. Lewis had hidden in the book, but most of the time it discussed it's relation to Roman and Greek gods.